My Blacksmithing Journey - The Iron Forge Fire Blackmithing Forum. I started my trip into Blacksmithing back in 1972,a year after I got out of the Army, Vietnam, and had a little time to chill out ! I'm writing this here because I have written it elsewhere in posts and I want all to know where I stand, I carry with me three personality problems that can and will interfere with this Hobby and maybe the Site. One and two being OCD and ADD, two things that interfere with life in every aspect and cause me grief more than I like to admit and then there is the PTSD, I never thought I had any problems from the Military Service but it keeps throwing itself in the mix from time to time. I still get extremely angry at times, the little things cause me the most problems but large problems creep in there too. You may notice when I post things, my directness, and my unfiltered wording, the Wife used to point it out to me but I never really saw it ! If you are assaulted by it, offended by it or just get PO'd by it... please accept my apologies a head of time and tell me to buzz off, I will understand ! Now that that is out of the way ! Back in Civi Life, I needed a Job and my Uncle suggested I try the Cape Ann Tool Company, a Forging Company, using Drop Hammer, three types were used, one being Board Hammers, where boards (2x4s) were used as the lifting mechanism along with Rollers that were powered by Electric Motors but were powered by a central shaft years before that; boards would lift the Hammer and then it would trip and drop. Also, there were two Hammers, German Hydraulic, these used Oil as a lifting mechanism, not too sure but they may have had a driven down force along with the 3500 lb. hammer weight. Then there was the BIG ONE, a 10K lbs. Drop Hammer... driven by Steam and that one had a Stream Driven Drop, talk about shaking the ground, and then we had a few Presses Forging and Punch Units, it was a good job. Forged on Hammer sized at 500 and 800 lb Board Hammers, 10K lb. Steam and also included the 2500 Board, a 3500 Hydraulic, 5000 lb Board, all had there little quirks. I forged on the Forging Presses for a few weeks, and then tried the Upsetter, which took a lot of stamina, and then back to the Board Hammers. During my turn as a newbie in the shop I was lucky enough to work with the Tool Making Blacksmith, an older guy, I couldn't help but think when he passes there will be one less person in the world with this kind of knowledge, little did I know of the Blacksmithing world out side of this Company or out side of Cape Ann, MA. Back to where I was, while I was working with the Tool Maker, he attempted to show me how to make Tongs, Pliers, small items needed in the Forge Shop and how to bend steel with out cracking the metal, but to me it was more than I wanted to know and I didn't learn as much as I should have. 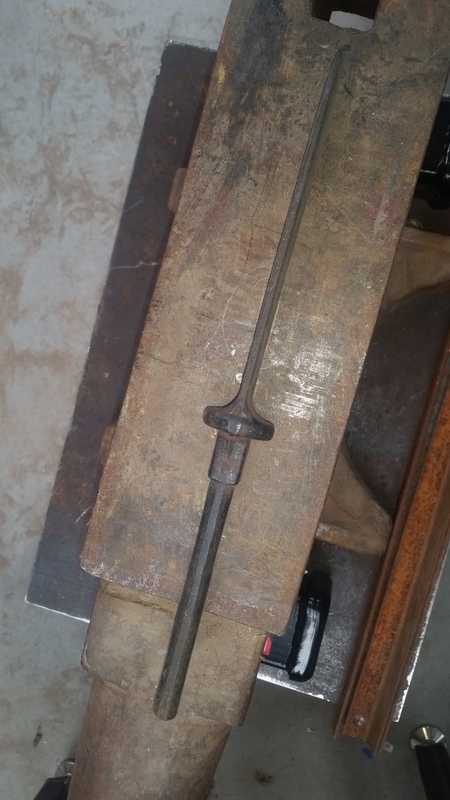 After I left the Cape Ann Tool Company, got married, and had kids, I thought about heating metal, a few pieces at a time to get a project completed... How do I go about that, my torches were good for one piece but not multi pieces, so I took and old heavy gauge 2 gal Oil Can, tried as I might there was no way I could get it to heat without burning up the walls of the can. I didn't know anything about welding up a heavy steel plate forge or using something other than my propane or my OX/Acetylene Torches so I went without ! Fast forward to 2014 ! In 2014 I moved to SoCal, purchased a Cape Style House and got started on a new barn/shop. Got interested in Blacksmithing AGAIN but did nothing but read, found my 108 lb Vulcan 10 Anvil, read some more, joined the "I Forge Iron Site", liked these guys but for some reason I got the short end of the stick from the site... still trying to figure out what happened and why. As people say once you find one anvil the rest just find you and that is what happen, found anvil #2, a Peter Wright, 162 lb. in decent shape. 2017, I now have a shop, two anvils and purchased a Diamondback Forge, getting a few things together and get started. the forge had a little mishap and is getting back together and hopefully will be working shortly. I need a few finishing touches for the PW Anvil Stand and I am hoping that my OCD/AADD/PTSD doesn't kick in and slow me down... too much ! Just got out of the hospital, has a small procedure, should only be approximately 4 weeks to get things together and I will start again. As of today, the 18th of Oct 2017, My Gas Forge has all of its Plumbing, not completely put together but close. Should be completed this weekend and then I need to pressure test it. I know what a pressure test is but not sure if air will work compared to the Propane Gas. Once Plumbed I will fire it up and gt some heat in it. Ordering some Mertikote (spelling) to coat the inside of the forge. have been told it will help reflect some of the heat and keep the forge hotter without a little less gas. I don't expect to save money on gas but it should also help protect the inside, at least I hope I read that correctly. 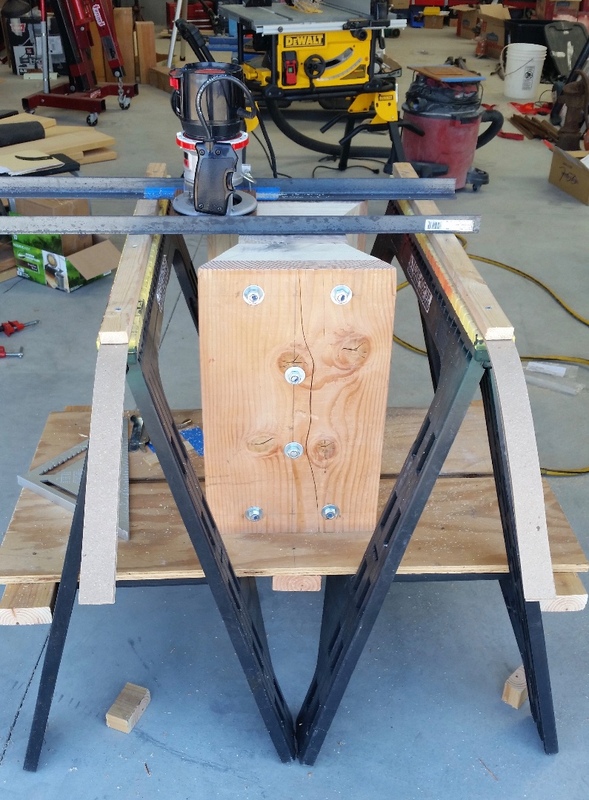 Making brackets this weekend to secure the the Anvil to the Stand FINALLY ! Just some 1" angle steel to hold things in place. Those are the only projects for the weekend and into next week, ADD always keeps me from getting too far, working on it though ! Do the air test first. it will show any bad leaks. A flame test should show any very slight leaks when the gas is on. As long as you test it as soon as you open the gas valve. Don't let the gas have time to build up. I use my melting furnace turned on it's side for a forge. Works OK but all the heat is way in the back. For what it's worth, I spent 4 years in the Navy, two Westpac cruises both on the flight deck. A few months in Danang, and got out fall of 71. PTSD is my buddy and my experiences with it are similar to yours. Became a full time farrier after nam with the plan to become a traditional Smith. Had and lost my family after 17 years. Who knows how that would have gone if the VA had recognized ptsd. Transitioned to blacksmith in '80. Never looked back. I've worked with and studied with many of the best of the best during my time. I have iron from Beverly hills to Prague. PTSD and a "friend" who understood this problem were instrumental in my loss of property etc. Been a "roadie" blacksmith doing g my second journeyman deal for the last 10 years. Lol, 10,000# of equipment, a broke down Willy's pu and 7 different shops this last 10. I have a trail of iron from here to there that Johnny Appleseed would be proud of. Alas, he only had a bag of seeds to worry about. I'm in the process of, if the gods of this great craft so desire, of setting up my last shop. Knock on wood. I've never quit and consider I've been "full time Smith" since nam. Not complaining, I would not change any of my life. I was stationed in DaNang, Vietnam, from Jan '69 till the end of '70, we may have crossed paths; my group of MPs hung around the Mountain in DaNang, the CB Base and the Hospital, a lot of good memories there ! PTSD... I didn't know what it was. I spend a year doing nothing, sitting around with a bunch of people on our sea coast, getting drunk, getting high and then "Light Dawned On Marble Head"... what am I doing... got a job, went back to school, tried Commercial Blacksmithing, and went on to engineering. Never thought there was a problem, had a newly found temper, quick to anger, but all seemed ok. My Wife of 40year now, we had been friends before that, told me I changed when I came home but I didn't see it. Only in the last ten years have I even noticed I still have a problem. Working with local VA as I write ! Thanks for the input, I will need to get a tank, my compressor is not hooked to electricity yet ! "A Flame Test"... let's see, the air pressure test will reveal large leaks, fix them and do another air pressure test. If there are no air leaks, turn on the gas, the run a flame along the plumbing ?!? I am thinking Flame, Propane... how does this work out ? Forgot about coating the interior of the Gas Forge with an IR Coaring, thinking... Metrikote. Order two pints from Wayne Coe. Shouldn't take too long to get it ! November 2017 - Well, as it turns out I heated my first piece of Steel, actually a purchased pin that wasn't shaped correctly ! My Forge isn't ready so I used my Torch to heat the pin, shaped it and fixed by Back Hoe, digging again. 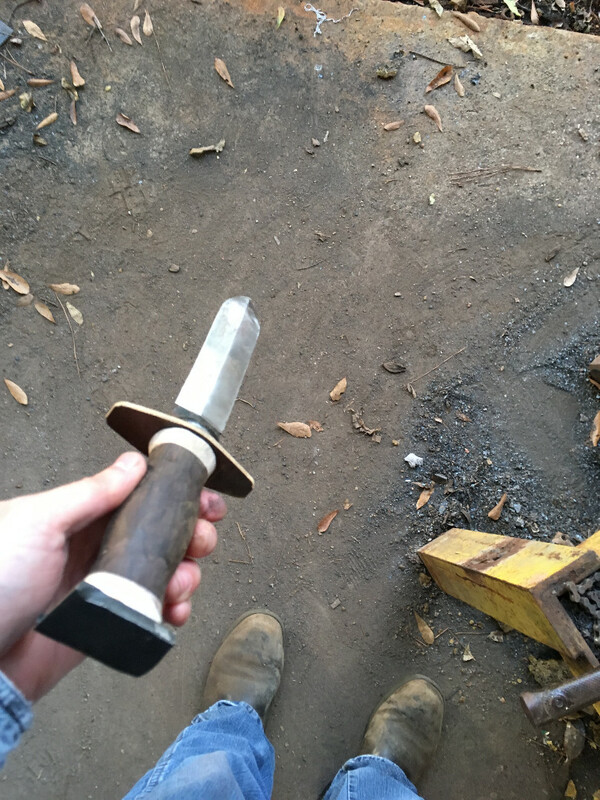 Although it wasn't a larger project and I didn't use my Forge, it felt good to have a hot piece of steel on the old girl and forming it to a shape that was needed to fix something. As far as the Anvil is concerned... when I purchased it over two years ago, I was told it hadn't been used for at least twenty-five years. With my two that makes twenty-seven years without a hot piece of steel on the old girl. Maybe this will be a sacrifice to the Blacksmithing Gods and I will be able to move ahead a lot faster than I usually move. I like forging and all, but there's something especially satisfying when you use your equipment to accomplish something practical. Or, if not smithies per se, were you otherwise trained in the metallurgic arts before straitened circumstances forced you into a life of aimless wanderin'? I know it felt good to fix the Tractor using my own equipment and not having to pay $15 for a pin + shipping, from the Dealer. I have just completed, a project that had a high priority but not a time priority. 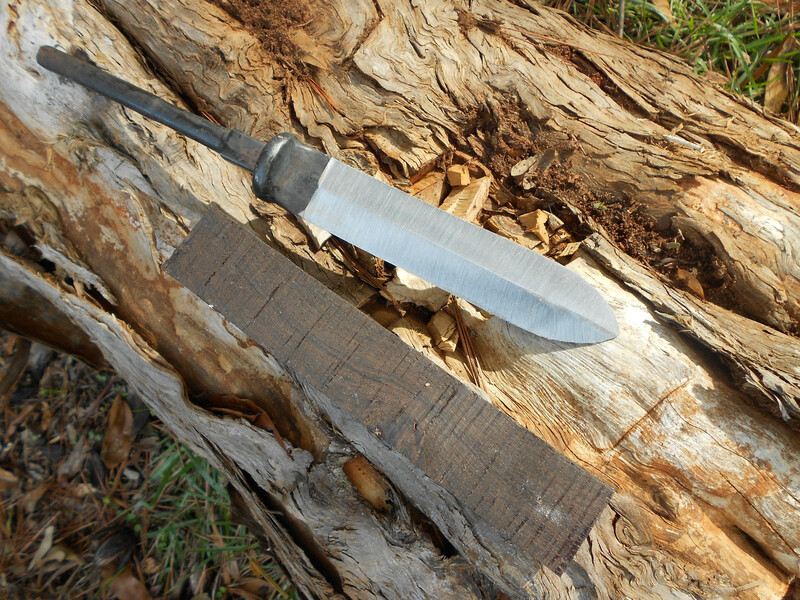 I Forged this raw knife blade, I was told, it was for a Navy Seal Order... i.e. "Navy Seals Knife " ! Wow, I just hit the jackpot, I digress, I forged the raw blade forty years ago, in a commercial Shop, with Large Drop Hammers, the work paid the rent and it has sit ever sense. In steps "jmccustomknives", Jim, I saw his work on this site, nice by the way, knew that I would never finish this blade, and decide to ask him to finish the Raw Forging and turn it into a blade, a knife ! Contact made, and Jim decided he would help me out and get this Knife finished. The above pieces were forged on a 2500 lb. Drop Hammer using a Closed Die Method. I think Jim had second thoughts when he received the raw forging but he turned out a great Knife. As I started saying in the beginning go a project off the list thank to Jim and got a great Knife in return. was to heat treat the blade and establish the grind. 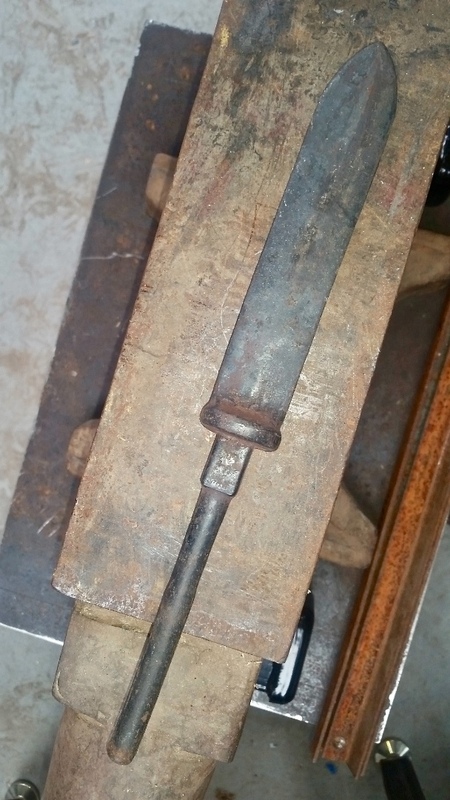 Then threads were brazed on the tang and a pommel cap was forged from wrought iron. The handle material chosen was African Blackwood and antler. A mock guard was made and the handle was mock assembled. I don't know if this blade was originally meant for the Seals, but it seams plausable since the handle would be large and the blade robust. Other than a little dye hitching a ride in the snap (at least I think that's what it was) I hope it serves you well for years to come. It looks good, the Knife wiped up nicely... looks good and it should last for a long time. Not sure who I should past it on to once my time is done but for now it is strapped to my side and draws a lot of attention. I am taking her to a Family Gathering today, will see what the family thinks of my new addition and THEN there is the rest of the story, when the raw forging was made, how the raw forging was made, and how some projects just DON'T get finish without help from people that know what to do. AND the finishing of the Knife, who, what, when, and where ! I think my biggest thing in not finishing this blade was not really knowing what to do or how to do it and it had been put away for so long it was a forgotten project, until I tripped on it when I moved to SoCal. From there and the iForge Iron Program on TV, I starting thinking about finding someone to ask about finishing the raw forging. I started having around one Web Site (not to mention any names) and didn't get a good feeling for anyones work, all good stuff but you need to know when you select someone, I moved to this Site, (The Iron Forge Fire), partially by need, partially by wanting to read about and learn about Blacksmithing... not Bladesmithing, far beyond me, but I got here and through reading and looking I found Jim of jmccustomknives, well it is all in the pictures now. Again thank you to Jim M., another project done but with a sense of satisfaction. The Wife likes it, one point ! I tend to rattle along here and put out to many words to say simple thing but it all worked out ! 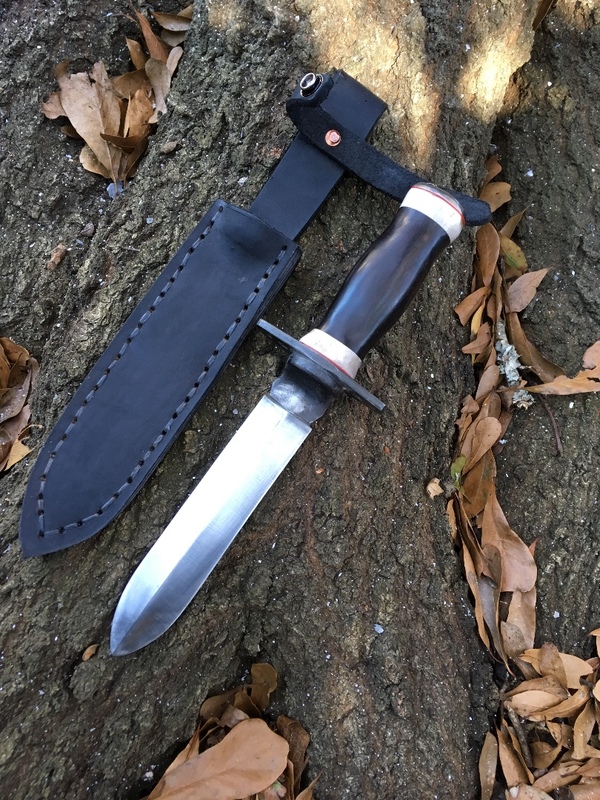 For anyone needing a knife contact "jmccustomknives" you have seen his work on this Site and you have seen what he can do when challenged with a special project that REALLY worked his abilities to create a GREAT KNIFE ! Been very busy wiring the Shop/Barn; trying to save a little money, added the House Patio and some walkways, still a lot of things on the Honey-Do List ! Haven't done much on the Blacksmithing side, always something else. I was re-reading my Journal and noticed I haven't put up any pictures of my Anvil Stand... so I will try it now. 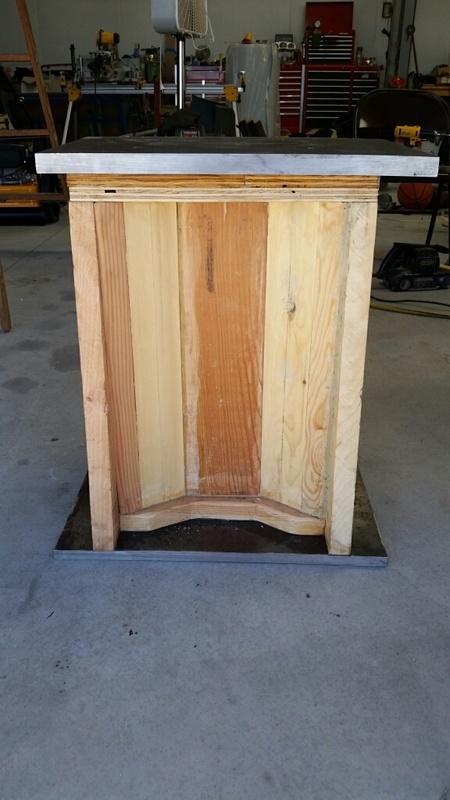 I stated out gathering construction lumber, 2 x 12s, 2 x 10s, and some 4 x and 6 x stock, I had seen a Stand made from construction lumber and thought it was a great idea, although I made this one to my liking and shape ! I first cut the boards as close to the pattern as I could and drilled the holes for the through bolts using a centerline as the datum. I needed to have a way to align all of the pieces, so I drilled the holes a little oversized allowing for some movement and alignment. I glued the boards one at a time, dropped them over the through bolts, tightened up the bolts and banged the top to get it all aligned, at least somewhat aligned based on the floor of the Shop. Once I was satisfied the block was as close as I could get it to level, I tightened all of the bolts a little more, Clamped the block with 8 clamps, and retightened all of the through bolts. She set for two days so I was kind of sure, the glue was dry. As close as I got to level, or as close as I thought I got, the stands a little wobbly and needed to be leveled by a better method. I attempted to use a belt-sander but no-go; I read about using a Home-made Stand and Router to level a Stump... so bingo, I will try it and setup my own Planer Stand, next picture. As you can see I used two Saw Horses and some thick plywood. I know you are asking is it stable enough, will it cut level...! Yes and Yes, it worked out great and I got a level package. Next is the block of wood, leveled as close as I could ever get... close enough though ! I then found I didn't like the height so I added some wood to the top and bottom, added the sides, then I added the steel I wanted on the top and bottom. I still have a few more pieces of steel to add but it is almost done. 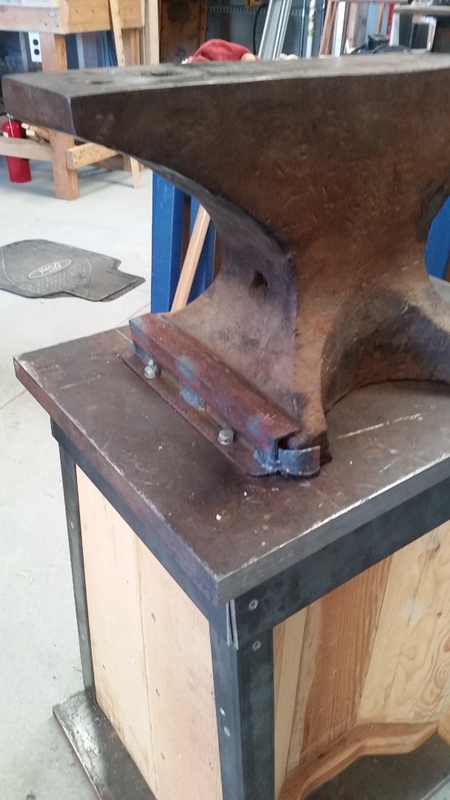 I have the Anvil on the stand and made a pin for my tractor and bent a hot plate for a bracket, and found the Anvil, not secured to the stand yet, and it was not only solid but very quiet, just a solid hit sound, a big surprised with the Anvil not being secured... NICE ! This is the only picture I have of the Anvil on the new Stand and the old stand next to it. You cant tell, but the new stand is taller than the old. 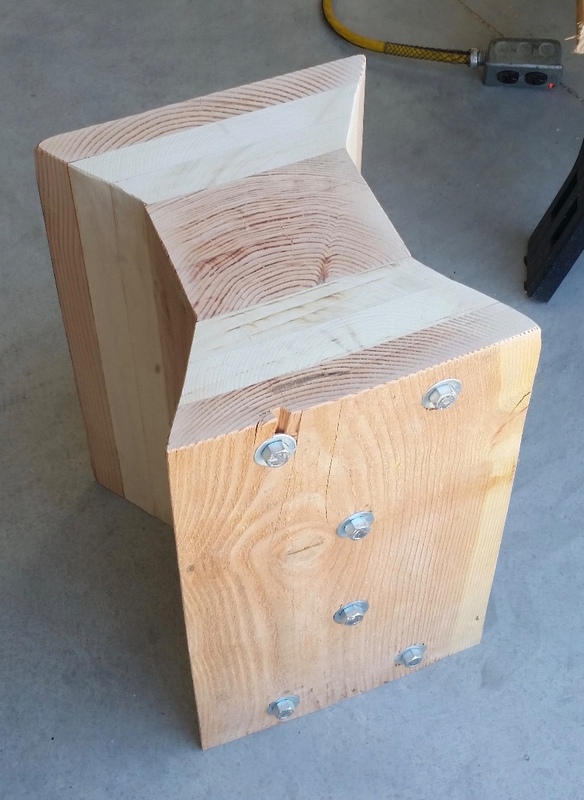 The cost of the new stand other than the "time to build" and the "time to collect the wood", is just the cost of the through bolts, w/hardware, and some new HD Adhesive, not much $$$ overall. I consider this stand to be a freebie right now. I just purchased two 2" Receivers to put under the Horne of the anvil, this will allow for various tools to be added as my skill set increases and I need to make a Tool Holder to go under the Tail of the Anvil. The Receivers and Too Rack, yet to be make, will be bolted to the upper steel plate, the lower steel plate will be used for securing the stand to the floor IF NEEDED ! Just a note, behind the Anvil/Stand is my new Forge, Diamondback Blacksmithing Model, still needs a few things done before firing up, but with all of the Home Projects to complete it will be a while. Right now the open spaces you see around the Forge/Anvil/Stand is filled with a lot of things so I can wire the shop... hoping for a couple of weeks before cleaning things up some. Trying to setup a Blacksmith Shop and do a remodel of a new home and shop is turning out to be more of a task than expected. So that is all I can say about my new Stand and the solidness of the stand, and the sound that isn't there from the Anvil when I hit a piece of hot steel and when I tap the Anvil with a hammer, big surprise... ! I am very happy with the way the Stand turned out, with the amount of work I put in and the years of use I should end up getting out of it ! Next project for the Blacksmith side is coating the Forge interior before firing, not sure when or how but it is something I want/should do, just need time to work on the Forge. Thanks for reading, hope it isn't too confusing, my writing that is ! Added new Picture ! Not done but getting there. Still needs: Welding in all joints, Tool Rack under Tail, and 2x2 Receiver. Over Kill... YES but whats new ! Nice anvil stand. I cobbled one together from scrap but it didn't look as nice as yours. 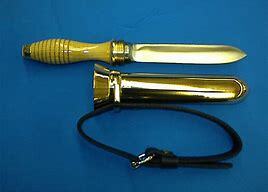 The knife kind of resembles a Navy Divers Knife, like the old Mark V divers used. I've wanted to cast one of these from bronze for a long time. I think you may have won the prize ! It is the closest to the blade design I've seen. It took a little longer to make than expected. A lot of changes while it was going through production. It started as a block and the first mod was the angled sides. I really like the way Jim finished the knife, it looks great. With all of my Honey-Do List Projects, I have not done much in the Shop. I did build a Mezzanine in the Barn, got about 2/3rd of the Electricity installed, have two more 120v Receptacle Circuits, one for the interior and one for the exterior and then one light circuit... AND the big one the Welder Circuit that will also be used for the Plasma Cutter; I am almost done with the electrics... ! The Forge is just sitting there, I am gathering steel square stock for an attempt at a Fredrick's Cross Training session... hoping for the best. I have read a few postings on the subject and watched a video or two of them being made, now is the time ! I don't hols any illusions about the first one turning out screwed up but I am hoping it won't take too many attempts before I can at least make something similar. My biggest problem with doing anything is that I am a procrastinator, I can't seem to start things that I want to do, and after I do it I wonder what was I waiting for. Not fully sure why but it is what it is and I will make my first attempt soon. Thanks to anyone that reads this and please I know I should jump in but I have this wall I need to climb over and sometimes it just take me awhile ! p.s. 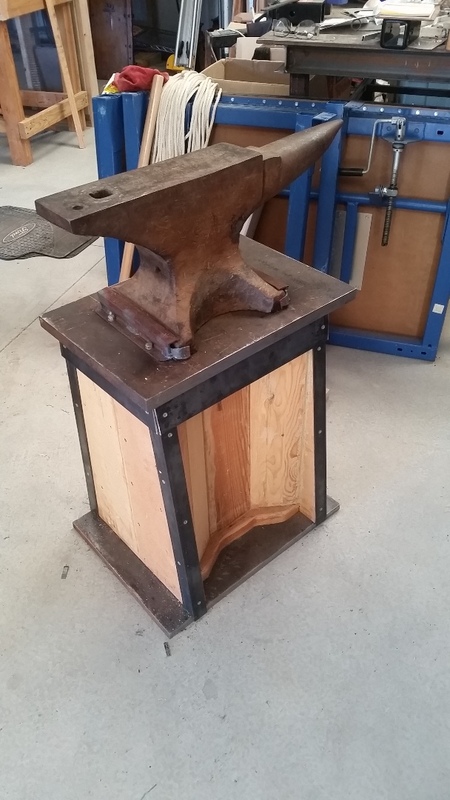 I did put some finishing touches on the Anvil Stand, I put some crude clamps on the anvil to whole it in place AND I noticed something really good, it is quite, no ringing, happy for sure, man is this thing heavy for wood ! I will get a picture and post it ! Here are two pictures of the ALMOST finished Stand and Anvil Mounting. I screwed the metal pieces in place until I get my Welder Receptacle in place, working on it. The second picture shows my attempt to make clamps for the Anvil out of some scrap pieces of 1" Angle. The ends got bent around but I may have heated a little too much, but I think they will hold ! All the joints will be welded and the base and top plate will be connected. 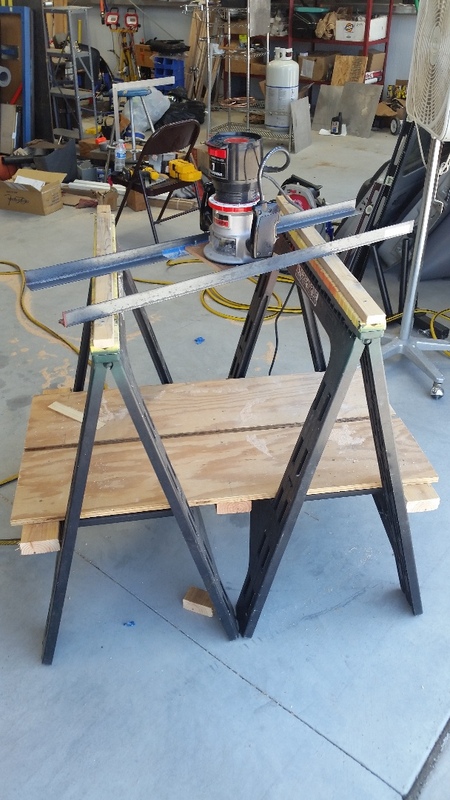 Next piece to be made for the Stand will be a Tool Rack, thinking 1/4" Rod, and then the 2x2 receiver. The new clamps are two pieces of 1" Angle iron, welded opposite of each other and bolts to the Top Plate. Notched the bottom piece and wrapped the ends to hold her in place. Tool Rack for side of Anvil ! Any suggestion as to the material ? I was thinking 1/4" Round stock, but thanks to my Patio work, I have 1/2" and 5/8" Re-Bar. Might try the 1/2" re-bar and see how that works out ! I think 5/8 is probably overkill. 1/4 you could probably get away with, but in my mind 3/8 makes the most sense. Depends on how much weight is going onto it. I too think the 5/8" would be over kill, but taking the 1/2" down to 3/8" sounds like a plan. Need to work on it ! BTW, I like that anvil stand. I know a lot of smiths don't like the "log stand" for anvils because it prevents them from getting their body close to the anvil, but with that design, you can have yourself a little closer. The indent is for just that purpose, I can step in close of work out further, depending on my back and how much it is complaining. I was Leary of the wood in the configuration I put together. Each assembly step, i.e. the block, I would put the Anvil on it and let the hammer drop on the top to see what kind of a ring it would've, wasn't too bad, slight ring but felt solid. 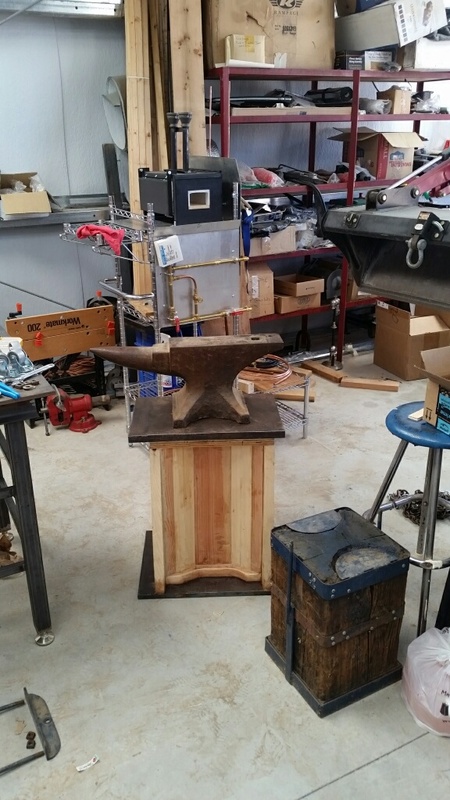 Once I got the top and bottom plates in place the stand felt more solid than I expected it to be, place the anvil on to and there was a ring but it was getting quieter with every added piece. I remembered when I got the Anvil, I thought the thing had lost all of its strength when the anvil wouldn't ring, I release the original hold downs and there it was the ring, SO I made a clamp system, screw it to the top block and there is almost no ring, NICE ! As you can see and know, in the picture the "In-Step" is there for and when you need to get close. I only intend at this time to work on smaller pieces so close is good. I looked at a number of Wooden Stands, some good workmanship and some OK but all were functional and worked for there purpose. I also looked at a number of Metal Stands, yes I wanted one but they were too expensive to and at the point where I was in my remodeling the house, there was only time to get the barn finished up, install the necessary electrics, and get it done; so I chose the easiest thing I had Surplus wood from all of the building Sites around my area; "Wham-Bam, got myself a Stand". I was looking for a Band Saw, not so much to cut pattern or cut off pieces, but I need something to make some cuts in steel for Fredrick's Crosses ! I started looking for a small unit, low power, not more than 9" of throat, even if it was a wood unit as long as I could cut steel it would work. 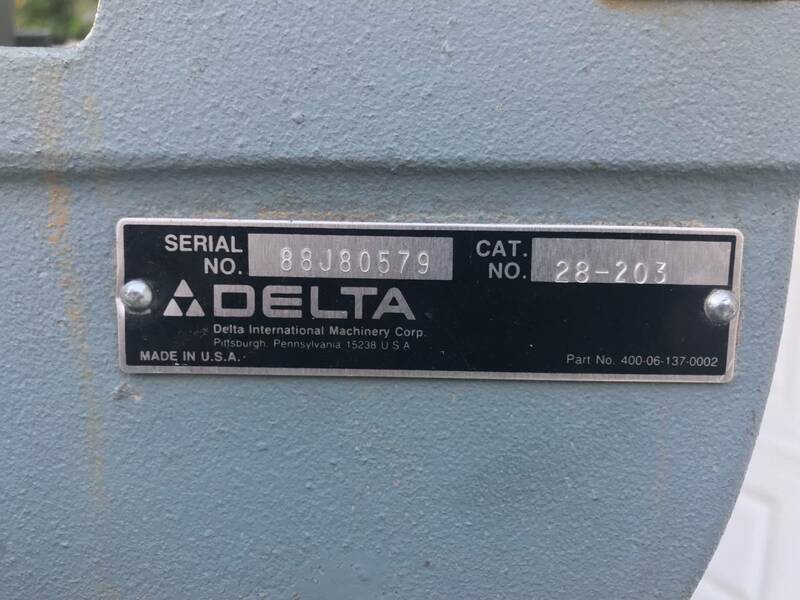 Went on Craig List,found a number of unit, a lot way too expensive, some that were POS, and some that were just not what I wanted but for some reason I saw a Delta/Rockwell 14" Unit, cast iron frame and from where I stood they looked like and had a reputation fro being rugged and reliable for both Wood and Steel. 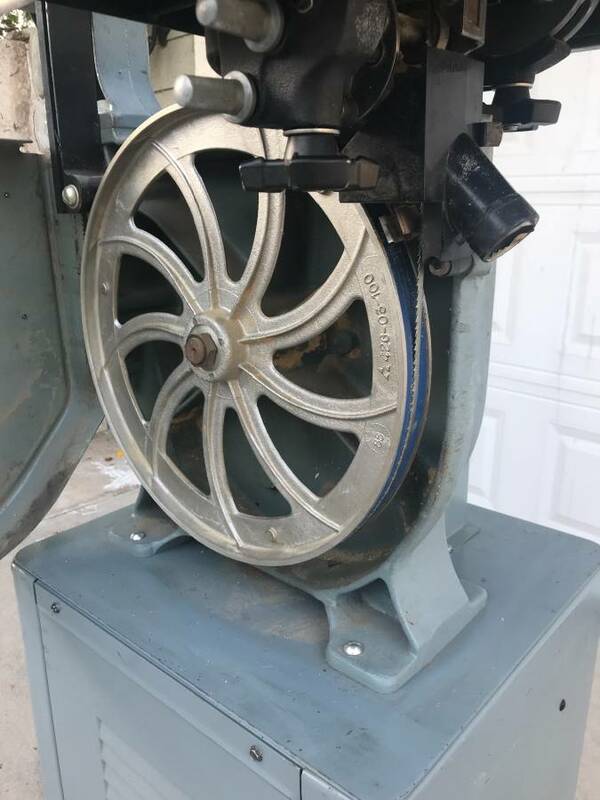 I found one, the guy wanted more than I wanted to pay, I figured if I didn't make an offer I would never know if he would accept less for the saw. The pictures looked good, clean saw, well kept, and the guy appeared to be a friendly type. 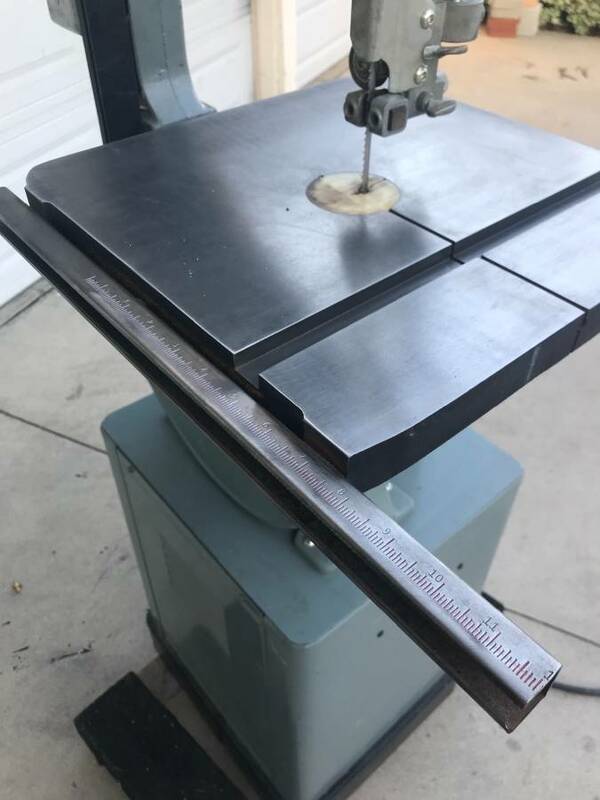 At first he wanted nothing to do with selling the saw for less than he posted for, can't blame him, but after he took time to tell me what to look for in a saw, how to test if it was going to cut true, I thought this guy is OK. I passed on it because of the price, too bad... Not ! Two days later I get an email from the same guy, he asked if I had found what I wanted or was I still looking. I asked if he had come down in price and he said he did want to but he was headed off for a vacation in a few days and wanted it sold before he left. I gave him the same number, explaining my last offer had been my best and he accepted. 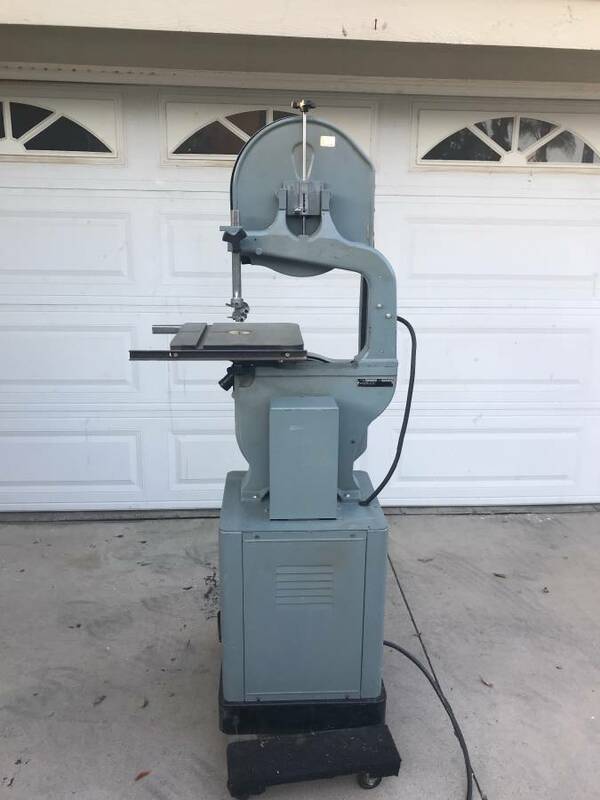 I now own but need to pickup a Delta Rockwell Band Saw, I'm happy ! The guy replaced all the bearing, the blade tires, some knobs, he left the Side Rail on the Table for the Fence but he doesn't have the fence. 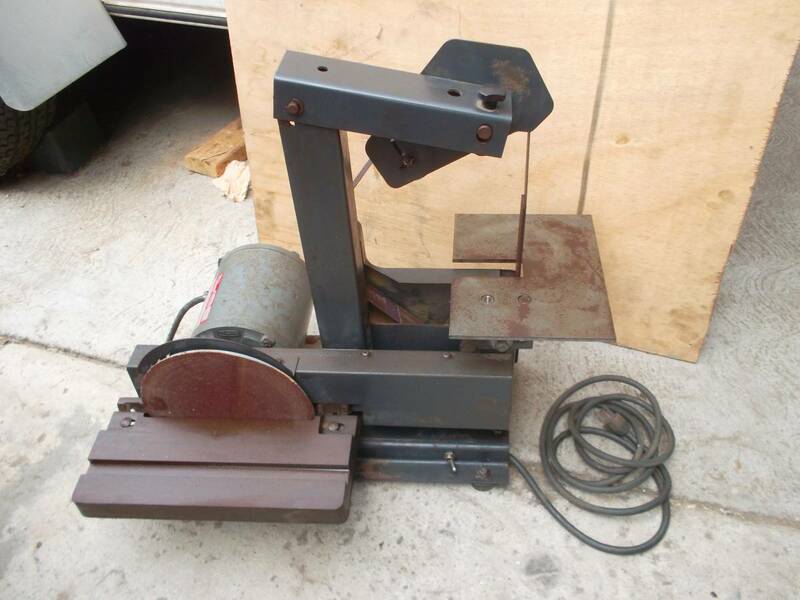 I think Krag has a Kit for this saw, may not even need a good one but something would help, in fact I am not sure if the side rails are OEM or not. Picking it up tomorrow, would have it today but the guy is Officiating a Wedding ! 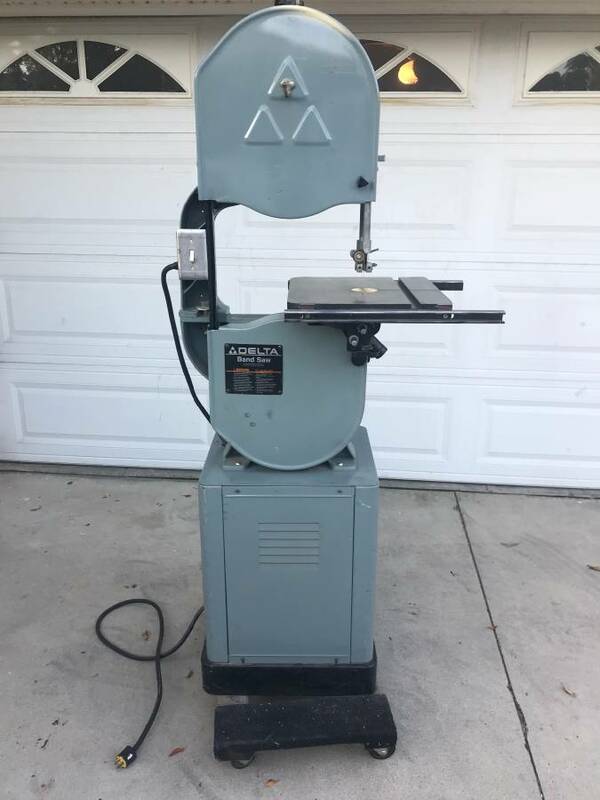 So I finally got a decent band saw to go in the shop, my last one I had was a Craftsman, sold it before leaving New England but wished I hadn't, now that dent matter any more. Next tool will be a small grinder, thinking 1 or 2 inch belt Grinder, looking for something used but not too used ! 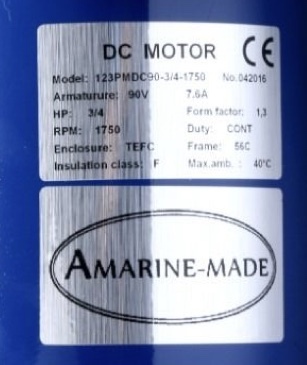 Looking at DC Power for the Bandsaw, for a Variable Speed Setup... ? 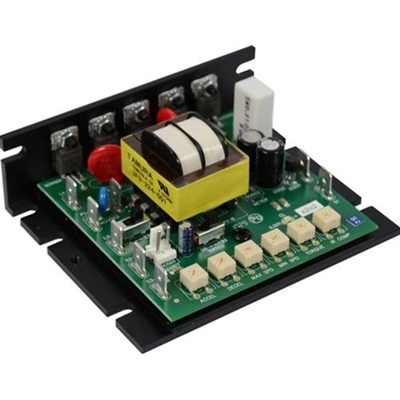 Dart power supplies for motor controllers work pretty well. I just checked them out, only problem is cost; they are a little pricey. Can't get a good picture but here is the Description and the Address. I watched three or four Variable Speed Motor and Controller Videos and ended up with this setup. Hoping for the best, all of the reviews on the parts are good ! My latest purchase is an old Sears/Craftsman 1" Belt Sander. This picture is a Delta version but it is the same Sander, funny even back then they were cross breeding ! As soon as I can get pictures of the New to me Sander I will post them. Paid $40 for it off of Craigs List, it runs, the Belt goes around and Tracks center. I've been looking for one of these since I gave away my last one... go figure ! 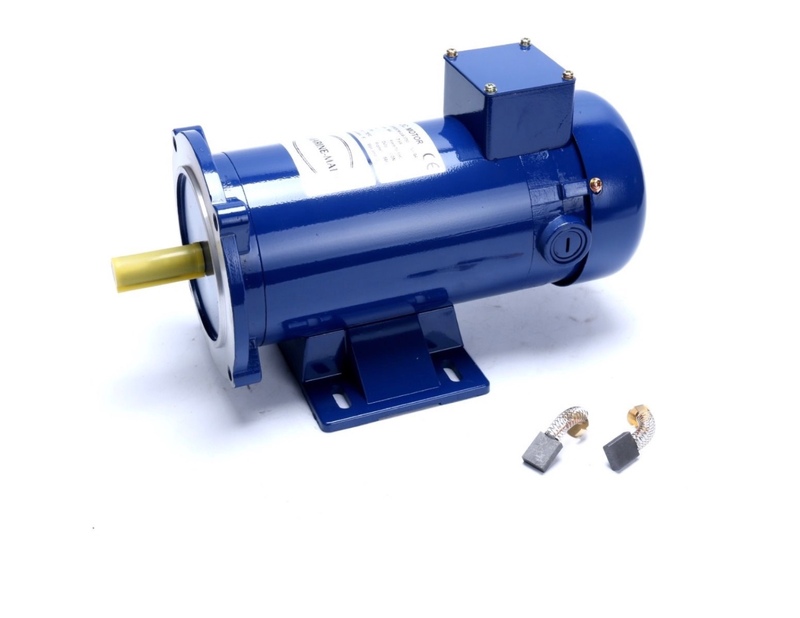 I have a spare 1/2 hp motor and will give it a try, need to do some measuring. I pulled my spare motor, turns out it is a 3/4 hp, 1725 rpm, 115 volts, everything but the horse power is the same. A little more HP than I was thinking... 1/2 HP was where I was at but I am sure this will do ! I have not done any measuring for fitment but it looks very similar, both the 1" Belt Grinder and the new Motor came from Sears so I am hoping for the best ! As most of you know I am the Procrastinator Supreme, when it comes to getting things done but I FINALLY finished my air supply in my shop. I got a Puma Compressor and Maxline to run around the shop. Got it finished yesterday, powered up the compressor and filled the system, had one bad Fitting, leaked like a sieve ! Finding the leak was easy, follow the air noise, after one attempt to disassembly, cleaned things up, and then reassembled, I replaced the fitting, wall-a no more leak. I pressure the system to 80 lbs., let it set for 24 hours, the system didn't lose one pound; got lucky I guess ! Now on to the next project, wiring the Bandsaw ! Another Post, I wish I could move faster, sometimes I can't get out of my own way ! I broke down last week and purchased a set of five Picard Tongs for what I think a great price. eBay started me off, I found what I thought would work for one set of Tongs, contacted the Seller, asked about a Military Discount, I know I have balls, and when he came back to me we started talking, keyboard to keyboard. We talked about a few things, Military, i.e. Vietnam, work experience, what I was going to do with these Tongs, getting started, and as we ended I had a set of five 20" Tongs, again for a decent price. I would tell you the price but I promised him not to mention what I paid... just that I got a good price. So I now have what I think will be more than I need as far as Tongs go... now to look at Hammers. As soon as I get his full Web Addie I will post about the Tools... ! I am so slow getting started, I wish I could move faster but things are as they are. Problem... I got the Tongs today and guess what, no I didn't get six or seven, but I did get the wrong length of Tongs from wht I ordered; 16" vs 20". I have contacted the Seller and we will see where we go.